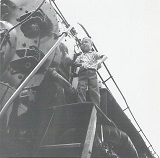 When I was about five years old when my family went to a train museum. This was a big event for me because I loved trains. At the age of five, I could identify and name almost every car of a freight train. Taking a ride in a passenger train was a big treat. So you can imagine my excitement of being taken to railroad museum. It was probably the highlight of my five years of existence. Everything went fine until I saw the bright red caboose. 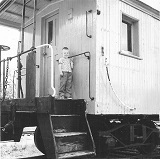 Even as a five year old, I knew that the caboose was the most important part of the train. That was where the conductor sat and kept track of every car in the freight train. The crew could sit up in the cupola and watch the train as it traveled down the tracks. It was more temptation than I could resist. The first indication that my parents had that I was no longer with them came when a lady next to them gasped. She pointed at the caboose and wondered aloud whose little boy it was that was standing on the roof. My parents knew who it was before they even looked. 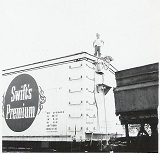 There I was, standing proudly on top of the caboose. I was in a problem of my own making, and I didn't even realize it. My father was immediately presented with an interesting problem of his own: how to get his five year old boy down off the train. The first thing my father did was to remain calm. He waved at me and told me to stand still so that he could take a photograph of me. After he shot the photo, he walked around to the rear of the caboose to look at the ladder that I climbed up. He realized that in order for me to get back down, I would need to lie on my stomach and slowly back up until my legs were over the ladder rungs. Then I would need to extend my legs down until my toes touched a rung. He looked back at me and saw that I was no longer on the caboose. I was now on top of the boxcar just forward of the caboose. My father caught up with me and once again got my attention so that he could shoot another photo. Then my dad did something that shocked the people who were down on the ground watching the whole incident; he urged me forward. My father had realized something that no one else in the growing crowd had seen. The safest way off the train was by going forward. It was a short jump down onto the coal car, and then a short jump down into the cab of the engine. While everyone else was focused on the problem, my father was focused on the solution. So with my father's urging, I gleefully proceeded forward, jumping from boxcar to boxcar until I reached the steam engine. When I reached the old steam engine, my father's plan unfolded perfectly. I was easily able to jump down onto the coal car, and then down into the cab of the engine. From there I proceeded forward until I came to the cowcatcher where I jumped down onto the ground. Mission accomplished. So what does this story have to do with spiritual things? There just happens to be quite a few similarities. Many times we find ourselves in situations of our own creation. We get into a relationship that we know God disapproves of. We get into debt after God told us not to. We live a lifestyle that is not pleasing to God. You know the story, you've been there; you've done that. You may even have the tee shirt. We foolishly make bad choices. We deliberately climb up on top of the caboose. Most of the time, we have no idea how to get out of the situation that we put ourselves into. We cannot go back the way we came, and the ground is too far away to jump. So what do we do? Do we have a pity party, or get depressed, or throw a temper tantrum? Many times that is exactly how we react. We tend to forget that it is our fault that we are on top of the caboose. So what is the answer? What are we supposed to do? We need to get on our knees and get in touch with our Father. God is right there waiting for us. Sometimes he has even been trying to get our attention, but we were too focused on ourselves to see him. He knows the way out of our situation. He knows how get us off the caboose that we climbed up. But he seldom simply removes us from the situation. He usually takes us through the situation. We have to go forward. We have to learn how to trust God. We have to jump across the boxcars in life until we get to the front of the train. We have to get to the front of the situation and confront the problem that got us into that situation in the first place. Father God, I am in a situation that I got myself into. I don't know what to do or where to turn, so I am coming to you. I ask you to forgive me for the sins that I committed against you that got me into this situation. I ask you to fill me with resolve to never commit those sins again. Please guide me through this situation and let me know that you are right beside me every step of the way. Fill me with your wisdom so that I will never desire to get into this situation again. Fill my heart with the desire to trust and obey you. I give you thanks in advance that you will get me out of this situation, and I will give you all the praise and glory when I get there. In the name of Jesus Christ I pray and I thank you God. Amen. © 2010 by Steven P. Wickstrom All rights reserved. Click the button below for more information about the copyright.